"Should This Gun Be Banned?" KIN is about an alienated, lonely teenager who one day finds a futuristic high-tech gun next to some dead, uniformed alien soldiers, which mysteriously only he can operate, and who then uses the gun to fend off the vengeful killer coming after his ex-con stepbrother. Despite uneven acting by some supporting players, KIN is an exciting crime thriller with science fiction elements, great special effects, and a redemptive, moral worldview stressing such values as repentance, integrity, loyalty, love of family, and doing the right thing, but it’s marred by some gratuitous extreme violence, foul language, drunkenness, and a scene with scantily clad, suggestive female dancers. KIN is an interesting action crime thriller with a science fiction dimension to boot. This movie brings together a forlorn teenager trying to adjust to his less than ideal circumstances, his ex-convict stepbrother and the ruthless killers who have a claim on his stepbrother’s life. Add a futuristic gun that in addition to the bells and whistles packs an extraterrestrial super punch together with the Predator like soldiers from wherever the gun came chasing the gun, and you have a story promising to hold the audience’s interest. Although marred by some gratuitous excessive violence, foul language and occasional over the top plot choices, its ultimately redeeming elements, such as repenting for past wrongdoing, elevating the value of family, and doing the right thing, restore some balance, but with mixed results. The location is Detroit, and right now Eli (Myles Truitt) is unhappy. His whole family is composed of only his stepfather, Hal (Dennis Quaid), who loves him but doesn’t know how to show it. Eli isn’t very interested in school and spends a lot of time going to abandoned factories looking for scrap metal to collect and sell in junk yards. One day he hears a lot of noise coming from one of the empty buildings. When he arrives, he finds several dead soldiers on the ground wearing futuristic looking uniforms resembling alien soldiers from the PREDATOR movie franchise. He also finds a strange looking artifact next to one of them, but when one of the soldiers suddenly stirs, Eli runs away in fear. Right around that time, Eli’s stepbrother, Jimmy (Jack Reynor), shows up at the house after a long stint in jail. However, he regrettably brings with him some unfinished business which threatens the family with some possible nasty consequences. As it turns out, Jimmy has a big prison debt with some very unsavory criminals, led by the evil Balik brothers, Taylor (James Franco) and Dutch (Gavin Fox). The next day Eli goes back to the site where he found the dead soldiers. The bodies have disappeared, but the artifact is still there. Eli examines it more closely. It appears to be a strange looking gun with very advanced technology, so Eli decides to take it home with him. Meanwhile, Taylor and Dutch warn Jimmy that, unless he comes up with the money he owes them, they will kill him and his family. However, just as Jimmy is about to hand over the money from his father’s safe, his father, Hal, shows up, and a gunfight ensues where Hal and Dutch are fatally wounded. Now, Jimmy has to get away before Taylor tracks him down him and kills him to avenge his brother’s death. With Taylor hot on his trail, Jimmy picks up Eli, who decides to bring the gun along. At one point down the road, they stop at a strip lounge in the middle of nowhere. A drunken Jimmy gets into an altercation with the manager, which starts a fist fight with the bouncers. Eli pulls out the gun to get Jimmy’s attackers to back off, but it goes off with such a bang that all the fighting stops. Supported by the incredible gun, Eli and Jimmy make it out of the lounge in one piece, but not before they befriend Millie (Zoe Kravitz), a pole dancer who takes a sisterly liking to Eli and flees with them. Now, with the bloody Taylor vowing not to stop until he takes out Jimmy if it’s the last thing he ever does, and some Predator-looking soldiers using their special tech gadgets to find Eli and recover the gun, it seems it’s only a matter of time before they’re found. Will the high-tech gun that can’t be bought in a store be a sufficient equalizer to forestall the killers, or will the alien soldiers ultimately catch up to them and take the gun that only Eli can so mysteriously operate? Indeed, the future certainly looks pretty dicey for Eli and Jimmy, no matter the outcome. 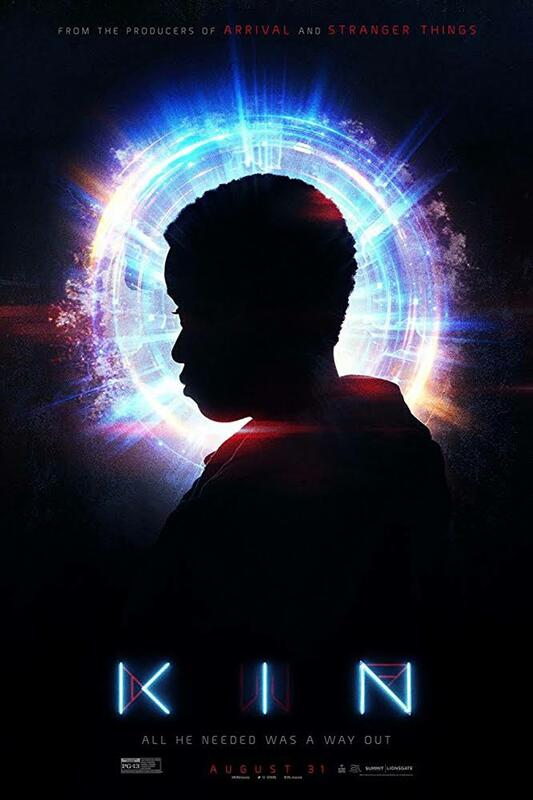 KIN is topped by great special effects featuring the use of the powerful futuristic weapon, and an excellent performance by Myles Truitt as the troubled teenager trying to do what’s right in the midst of family dysfunction and emotional pain. It is also uplifting to see how once he gets hold of the unbridled power that emanates from the deadly gun he’s still able to maintain sober control over the circumstances, and even grow beyond his age in the process. Also, his brother Jimmy wears a chain with a small cross on his chest, but still finds it hard to shed the destructive effects of a life of crime as he tries to leave his past behind and begin a path to redemption. James Franco as the wicked Taylor Balik, however, lacks depth and doesn’t go much further than coming across as a caricature, a central casting villain reinforced by over the top murderous behavior. Sadly, Zoe Kravitz, by dutifully walking through her parts without much energy or inspiration, doesn’t fare much better here either. That said, there’s enough conflict to whip up an interesting action-packed plot. To their credit, the directors and producers should be commended for keeping the number of obscenities and profanities to a low level, unlike many other PG-13 movies with lots of action these days. Even so, the movie’s gratuitous violence, which shows an excessive number of killings to prove the villain’s vicious nature, is over the top and unnecessary. Nevertheless, KIN has a noble spirit where a main character shows regret for the wrong and destructive things he’s done in life, while elevating the value of the family and the love that this entails. Due to the extreme gratuitous nature of the violence, however, major discretion should be exercised before choosing to see this movie, especially for anyone other than adults. Criminals extort money and threaten family of one debtor, an ex-convict. KIN is a crime thriller with science fiction elements. Eli is a forlorn teenager trying to adjust to less than ideal circumstances. His widowed stepfather loves him but has trouble expressing it. Eli comes across a futuristic gun with some apparently dead aliens next to it. He takes the gun home just as his ex-convict stepbrother, Jimmy, suddenly reappears after a prison stint. Jimmy owes a financial debt to two criminal brothers. A fight ensues where one of the evil brothers is killed, and Jimmy and Eli go on the run, with only the alien gun to protect them. Despite uneven acting by some supporting players, KIN is an exciting movie with great special effects. Even better, it has a redemptive, moral worldview stressing such values as repentance, integrity, loyalty, love of family, and doing the right thing. However, it’s marred by extreme gratuitous violence where people, including police officers, are shot dead or blown up into a vapor. KIN also has some foul language, heavy drinking and a lounge scene showing scantily clad women dancing suggestively. Extreme caution is advised for KIN. STD’s Reach All-Time High in the US: What’s to Blame?